AB Rocket™ fat blasting system Get rock hard abs in just 5 minutes a day! Target upper, middle, lower abs and side obliqes without neck and back strain. 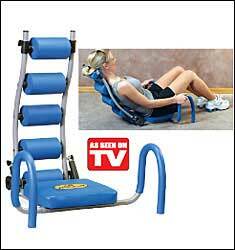 Simply roll back and forth on cushioned seat with massage rollers for ultimate comfort while you blast fat. Cylinder launch technology™ supports neck and back. Rock your way to a firmer, stronger, sexier you in just 5 minutes a day! Gym quality steel, 26 1/2 x 7 1/2 x 14 1/4". Try it in your home risk Free for 30 days and if you’re not completely satisfied, for any reason during your trial, you can simply return it for a full product refund, no questions asked. If you slim down and look great like we guarantee you will, we will charge you the remaining three easy payments of $39.95 on a monthly basis. Shipping is Free and the 30 day Risk Free offer is guaranteed.